Our accommodation is the perfect place to stay if you are visiting Ludlow’s restaurants, markets, shops, pubs, museum, castle or church. It’s also the perfect base to explore the surrounding area, including the Shropshire Hills and Mortimer Forest, with miles of beautiful countryside and stunning landscapes to explore. These comfortably furnished rooms are light, fresh and warm. Each is furnished with twin beds, bedside cabinets, reading lights and wardrobe. 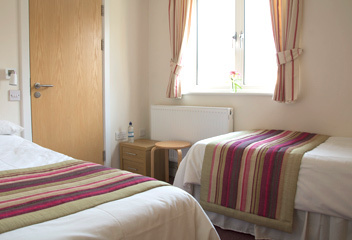 Each room has an en-suite bathroom which comes with a supply of fresh towels and complimentary toiletries. These rooms are of an 'L' shaped configuration around a spacious shower room. 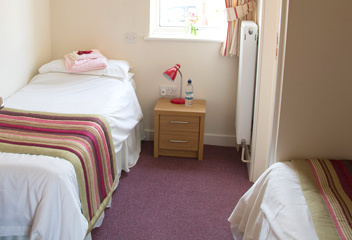 These bright, fresh and comfortable rooms have 2 single beds in each, bedside cabinets, reading lights and wardrobe. The spacious bathrooms are fitted with quadrant showers, toilet, basin and shaver points and come with a supply of fresh towels and complimentary toiletries. This family room, which sleeps up to four people, is furnished with a double bed and set of bunk beds. It has bedside cabinets, reading lamps, a wardrobe and a chest of drawers. It has an en-suite shower room and comes with a supply of fresh towels and complimentary toiletries. 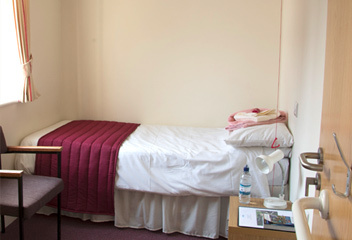 Perry is a single accessible room with an en-suite wet room. 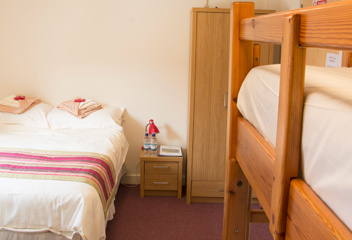 The room is comfortably furnished with a single bed, bedside cabinet with reading lamp, wardrobe with a mid-height hanging rail and armed chair. The wet room has a shower chair and grab rails, toilet and basin and comes with a supply of fresh towels and complimentary toiletries. The room has an emergency call system to an adjacent room for a carer (please see the access statement on our website for further details). This room is situated on the first floor with both stairs and lift access. Breakfast are available at the on-site cafe from 8 am (Tuesday-Saturday). Our on-site caterers, Pea Green, can also provide evening meals and packed lunches on request.